INFINIDAT Metrocluster със 100% гаранция Always On! 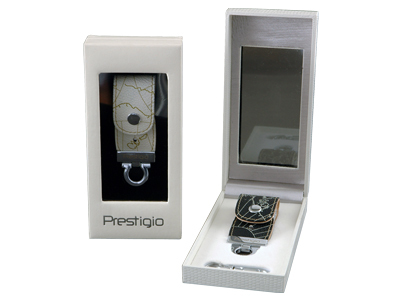 Prestigio Technologies Ltd. introduced a new gift box for its bestseller Leather Data Flash. Limassol (Cyprus), December 3, 2007 -- Prestigio Technologies Ltd., a dynamic international vendor of state-of-the-art products for Digital Home and Digital Office, introduced a new gift box for its bestseller Leather Data Flash. Products in a trendy packaging will appear on shelves at Prestigio partners’ stores across Central and Eastern Europe, Middle East and North Africa on December 10, 2007. However, Leather Data Flash in its previous gift box will still be available. The packaging has been completely revised and foreshadows the great quality that awaits you once you open it. Designed to catch attention, the new gift box has become more appealing and brighter and with the see-through window consumers get a clear and quick idea of what the product is and what it serves for. We all know it is what is on the inside that counts, but Prestigio Leather Data Flash packaging is a work of art in and of itself. The new redesigned gift box is no exception to that rule. Created in several colour variations it makes Leather Data Flash shine with its best and enables consumers to choose their most appropriate individual style. Packed into a stylish box Leather Data Flash is introduced as an ideal gift solution either for men or women, for the upcoming holidays or any other occasion. The ultimate nature of this gift is emphasized by its preciousness as products come in Limited Edition that is elegantly marked on the box. What hasn't changed is what's inside the new gift box — high-quality and premium functionality of Leather Data Flash featured by appealing design of real leather coating. That's one thing Prestigio promises will never change. Prestigio Technologies Ltd. is a highly dynamic IT company providing Digital Home and Office consumer solutions to the market. Having started as a small R&D subsidiary of ASBIS Group, during the last several years Prestigio has become a supplier of unique hi-tech solutions and products to consumer market. Digital Home and Digital Office are the two main focus areas of the company. Investing in the combination of "The Art of Hi-Tech" (solutions where hi-tech products become works of Art), the company has uniquely positioned itself on the market. Currently headquartered in Cyprus, Prestigio actively operates in the EMEA region through representative offices and business partnerships located in key business centres of the region and offering its customers an excellent portfolio of cutting-edge IT products and value-added services. Disclaimer: The information contained in each press release posted on this site was factually accurate on the date it was issued. While these press releases and other materials remain on the Company's website, the Company assumes no duty to update the information to reflect subsequent developments. Consequently, readers of the press releases and other materials should not rely upon the information as current or accurate after their issuance dates.